Barcelona's restaurants and bars offer a wide and wild variety of cuisines and creative dishes. Even the most ardent foodie will confess that grazing on tapas and dining in fine restaurants is both wearing on the wallet and bruising on the palate. When out and about there will come a time when you want something more ordinary… a tasty, light bite. Well… you could grab a pizza. And, one of the best places to grab a pizza in Barcelona is Lucania II in Vila de Gràcia. For less than the average price of a Bikini (grilled ham and cheese sandwich) you can enjoy a delicious, freshly prepared pizza margarita. 20 plus variations — including one of my favourites: minced beef cooked in beer with bacon, plus two or three daily specials. Barcelona is a culinary capital offering a wide and wild variety of cuisines and creative dishes. However, grazing on tapas and dining in fine restaurants can be both wearing on the wallet and bruising on the palate. There sometimes comes a time when you just want something more ordinary, a light bite to fill a hole while out and about. Well, you could try a Bikini. Yes, Bikini. When wandering around the city you’ll see the word Bikini scrawled on chalkboards outside snack bars. It’s a very popular snack, probably the most popular snack after the ubiquitous patates braves [patatas bravas in castellano]. 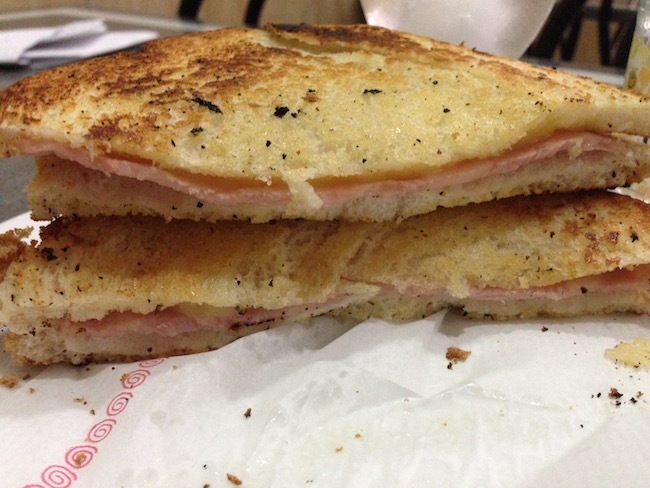 A Bikini is a grilled ham and cheese sandwich. The name, Bikini, is unique to Barcelona and Catalunya. Try ordering a Bikini outside of Catalunya and you’ll prompt incomprehension, a measure of confusion, and perhaps a little argument; in Spain a Bikini is known as a mixto. 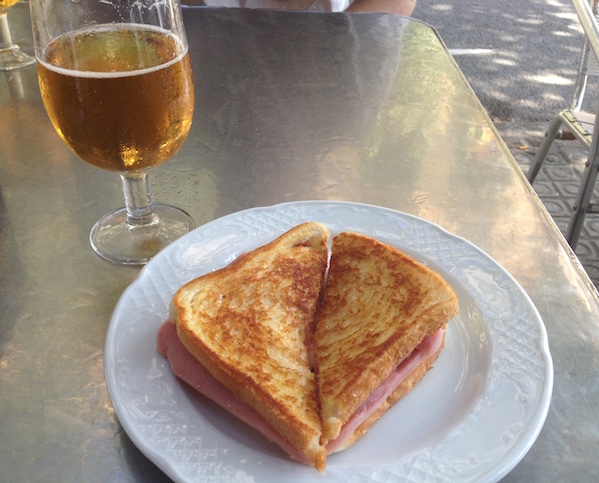 The sandwich, similar to un croque monsieur in France, is said to have been so christened here, in Barcelona, in 1953. There are two food tests for any snack bar in Barcelona — the Braves test and the Bikini test. 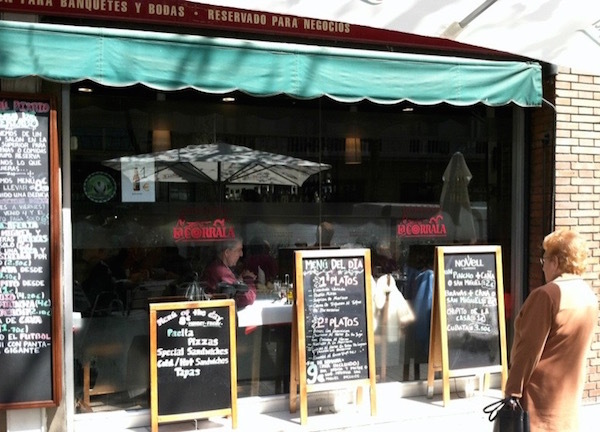 Spain’s most popular lunchtime deal — the menú del día — was invented for the convenience of tourists. Ironically, most tourists are not aware it exists. When visiting Spain you’ll save yourself a ton of money, and discover some wonderful food offerings, if you adopt the local custom of eating your main meal of the day between 2pm and 4pm and opt for the menú del día. c) choosing a wine to accompany your meal. On a good day, nothing beats a good, long, chatty menú del día with close friends or family. 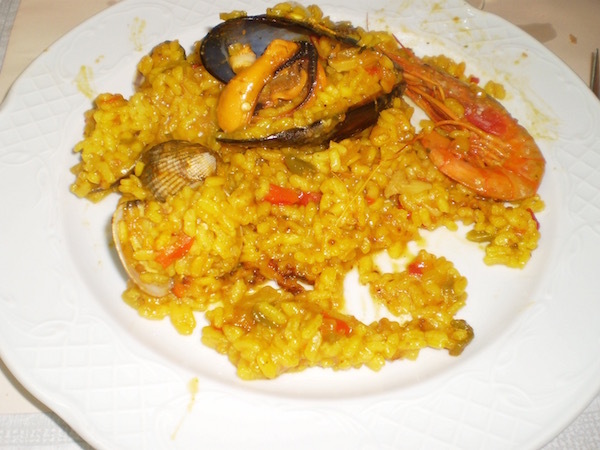 Paella served as a first-course as part of a menú del día. So, what is a Menú del día? Most restaurants in Spain, even Michelin-starred establishments, will offer a menú del día — menu of the day — a fixed-price lunch, Monday to Friday. A menú del día will usually offer a choice of 5 or 6 first-courses, 5 or 6 second-courses, 5 or 6 desserts, wine, water (or beer or soft drink) bread and coffee, for an all-inclusive price of anywhere between 6,50€ and 30plus euros including service and tax. Though things are changing, we don’t do ‘cocktail’ sauce and other sweet’n’spicy gloops in Barcelona. Tataky de lomo de buey con enoquis (Tataki of beef tenderloin with enoki mushrooms), as served as part of the menú degustación at Goliard. Off to an art exhibition opening at Vinçon for 8pm and to meet with two visitors from Montreal — Binky and Jennifer. The opening seemed much more busy than is usual. And, the age profile of those attending seemed much older than usual. The older demographic is in part explained by the fact that the artist, Francesc Artigau, first exhibited at Vinçon in 1975 — two years after the gallery opened. The exhibit consists of just one large painting split over three canvasses. Here’s a LINK to background about the exhibit. And, here’s a LINK to the artist’s website. We met Binky and Jennifer, and, from the off we hit it off. We had a Moritz beer and a few bites of cheese, crackers, olives and llonganisa then took a tour of the store. Then we all headed up to Gràcia and Bar Bodega Quimet — one of my favourite haunts for a bite and a drink. At around 9pm it’s a comfortable 15 minute stroll — during the day it can be a frenetic hike. During the day you spend as much energy, if not more, sidestepping the shoppers, gawkers and strollers, as you wend a way up Passeig de Gràcia. Bodega Quimet was packed. Tuesday night on a cold, damp February evening — packed. Must tell you something. We perched ourselves at the bar and ordered a bottle of Montsant and a few delicious bites. Then got ourselves seated at a table and ordered more bites and more wine. The chat flowed readily. Laughs came easily — in part prompted by my being locked in the toilets. Good food, good drink — great company. We met having exchanged a few emails — we parted as friends. The Barcelona effect — again.